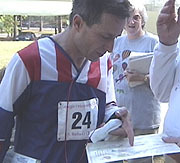 Georgia Orienteering Club (GAOC) hosted the Second USA ARDF/Radio-Orienteering Championships from April 19-21, 2002 at F. D. Roosevelt State Park near Pine Mountain, Georgia. The competition got under way on Friday afternoon with a practice event, followed on Saturday by the main two-meter hunt and on Sunday by the 80-meter hunt. 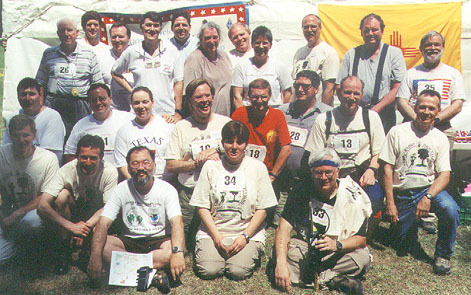 Best performance overall was by Gyuri Nagy KF6YKN (photo at lower left just after 80-meter hunt). He averaged 19 minutes per fox on two meters and an amazing 15 minutes per fox on 80 meters. Gyuri, whose other call is HA3PA, is a part-time US resident who learned the sport in his native Hungary. He competed in M21, the prime age category for men, requiring him to find five foxes on a six kilometer forest course. Gold medalists in other age and gender categories (listed in alphabetical order) were Jerry Boyd WB8WFK (M40-2m), Martha Carr (F50-2m & F50-80m), Bill Farrell (M60-2m), Valerie Meyer KG4QWE (F21-2m & F21-80m), John Munsey KB3GK (M60-80m), Debbie Pendley KD5LOK (F35-2m & F35-80m), Charlie Siler KO4NO (M50-2m & M50-80m), and Jack Stump KD5OEO (M40-80m). In addition to the hunts, there was a cookout on Friday evening, a spaghetti dinner on Saturday night, and an award ceremony following the 80-meter hunt. Laurie Searle KG4FDM of GAOC did an outstanding job as the overall Meet Director. She was assisted by Sam Smith N4MAP (photo at right), who set the ARDF courses and supervised the starting line. Laurie and Sam were helped by many GAOC members, including Robin Shannonhouse as Registrar and Scorekeeper. Click here for KØOV's album of forty photos from the Championships. .